You probably know that I am a bit of a cricket fan. You probably also know that my jokes are legendarily poor. 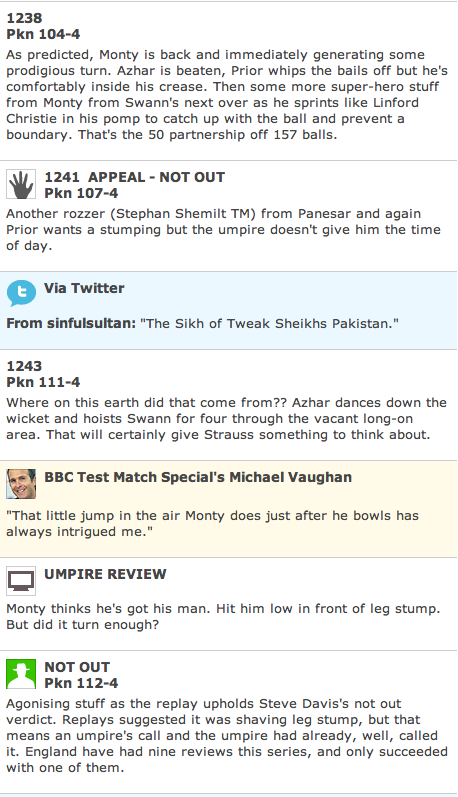 TMS Live text commentary therefore appeals to my particular taste of distraction (see posts passim…) Today, during day three of the second England Pakistan Test from the Sheikh Zayed stadium in Abu Dhabi, the England spinner Monty Panasar found prodigious turn in the pitch to cut swathes into the Pakistan top order. The England fans love Monty; his relentless enthusiasm for the game, and wild celebrations of wickets are famous, as is his total inability to field and bat (with the exception of in Cardiff, but dont remind our friends from down under.) Despite his heroics in that Ashes test he was dropped in 2009 and has rather lived under the shadow of England’s first choice of spinner, Graeme Swann. The dusty and turing wickets of this winter’s desert tour have however demanded his recall, and the selectors have been rewarded for their choice. Towards the end of the day the commentator asked for contributions or suggestions for tabloid style newspaper headlines of the day’s events. I tweeted my suggestion in, and low and behold it was aired on the BBC. This was the second time my comments have been put out there by the BBC… I wonder if they would like to commission or sponsor this blog… no? thought not.